Since then, I came back home and tried my hands at frying vermicelli…haha after a few attempts I managed to get it right. It has become my signature noodles (“,) My Piggies love it too. For dinner yesterday, I fried vermicelli with bittergourd, prawns and egg. It was well done and we finished it in seconds!!! Wasabi being "hot and fiery without burning," which changes to a sweetness that lingers in the mouth makes it so darn addictive. I googled and found this interesting fact about wasabi. It has more goodness than meets the eye. 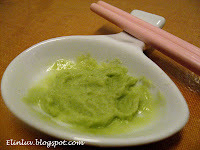 wasabi's effectiveness against stomach cancer cells. wasabi may be effective against the tooth-adhering ability of the bacteria Streptococcus mutans, thus inhibiting dental plaque and decay. The risk of hormone-related malignancies, such as breast and prostate cancer, may also be lowered. wasabi's ability to stimulate the liver and gallbladder, aiding in the digestion of fatty foods and the processing of food nutrients. wasabi include its effectiveness against diarrhea, blood clots, inflammation, and asthma.Its pungent aroma may help relieve sinusitis and bronchitis. wasabi reportedly also contains potassium, calcium, and vitamin C.
Sorry I have digress, back to the recipe for the above fried vermicelli. Boil ½ pot of water. When water boiled , put in the dried vermicelli and stirred till it loosen. Once loosen, take out and run over cold water and drained dry. Put aside. Meanwhile , heat up the olive oil in a non stick wok, sautéed the garlic and chili padi, then add in the prawns. Dish up the prawns and keep aside. Add in the bittergourd and fry till half cook, add in the beaten egg and fry till it is cooked. 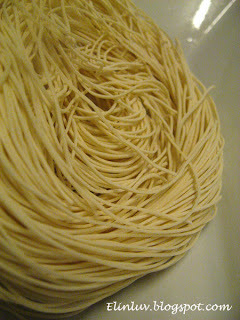 Add in the vermicelli and use a chopstick, loosen the vermicelli up and add in the mixture of seasoning and stir fry till the vermicelli is dry and well mixed together with the bittergourd and eggs. 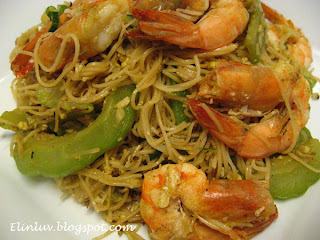 Add in the cooked prawns and stir fry for a min and dish up. Serve hot. This is special, I have never come across any fried vermicelli with bitter gourd.